If you are a student of B.A. / M.A. or CSS then you must read and remember these 50 Important English Proverbs and Sayings for BA, MA and CSS Exams and prepare for the exams. As these are very important you may get highest marks in the exams. War is to man what maternity for woman. Make the hay when the sun is bright. Hear twice before u speak once. An idle man’s brain is devil’s workshop. Early to bed aid early to raise makes a man healthy ,wealthy and wise. Early raisers settle early in their lives. Rolling stone gathers no mass. Arise Awake stop not till you reach your goal. Better to be alone than to be in a bad company. Misunderstanding grows, cut your ego not relationship. 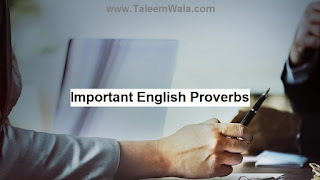 If you want more quotes, sayings and proverbs in English to prepare for the exams then comment below, share this with your friends and we will update you with more English language proverbs.